As an addition to the traditional mid-year crowdfunding check, for video games, I have decided to give tabletop games their own blog post this year. There is a dedicated interest for these numbers, and they are quite fascinating to follow. As a quick catch-up, you might want to have a look at the post on the year 2017 performance for games on Kickstarter. 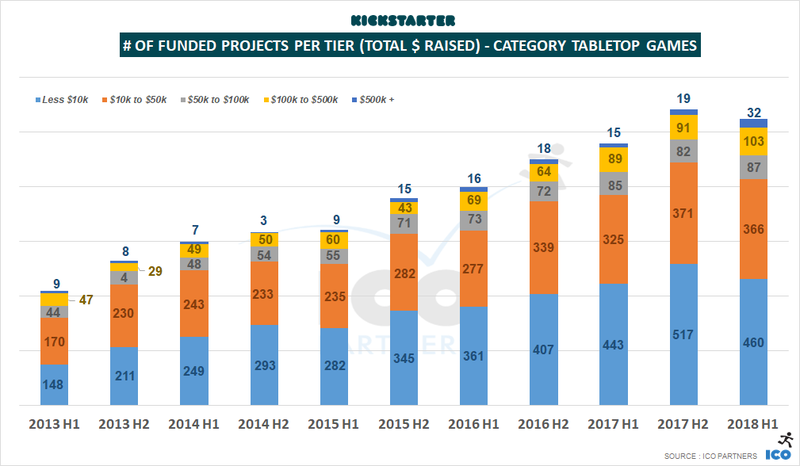 Let’s get started with the question I always get when talking about the ongoing performance of the tabletop category on Kickstarter: is the bubble bursting yet? And it’s hard to say if it is indeed a bubble at all, considering how steady the growth has been. Tabletop games have almost raised $80m in just 6 months this year. 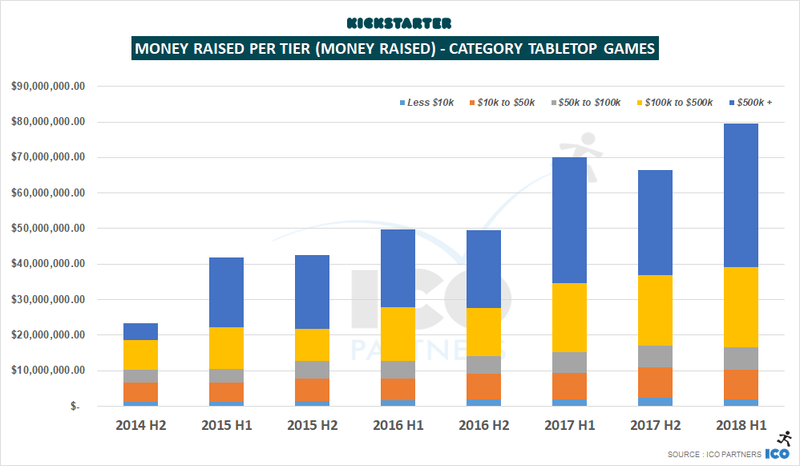 Tabletop Games have raised more money than any other category on the platform during the period, and represent 30% of all the money raised on Kickstarter. 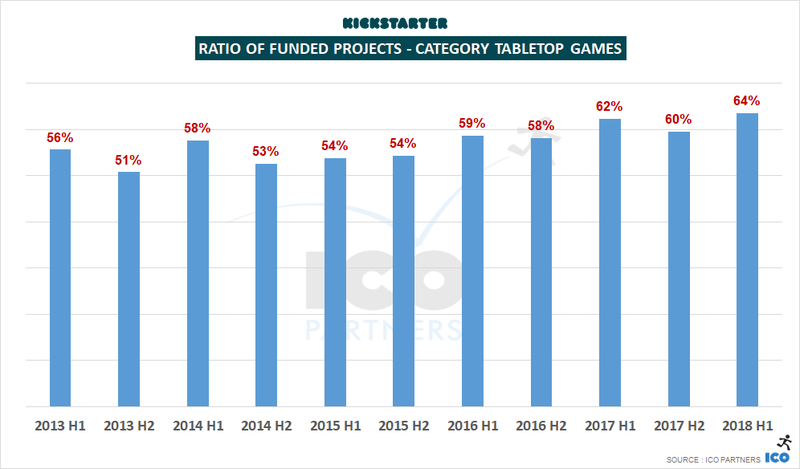 As a reminder, Tabletop Games were representing 23% of all the money raised on Kickstarter in the year 2017, and if there is a trend in seasonality we can see, it is that the second half of a year is usually bigger for projects of that subcategory. I normally don’t use gifs in blog posts, I feel this warrants an exception. Looking into the total number of campaigns launched on the platform, we can see a drop from the previous period. However, this is in line with previous years, which see fewer campaigns during the first half of a year. 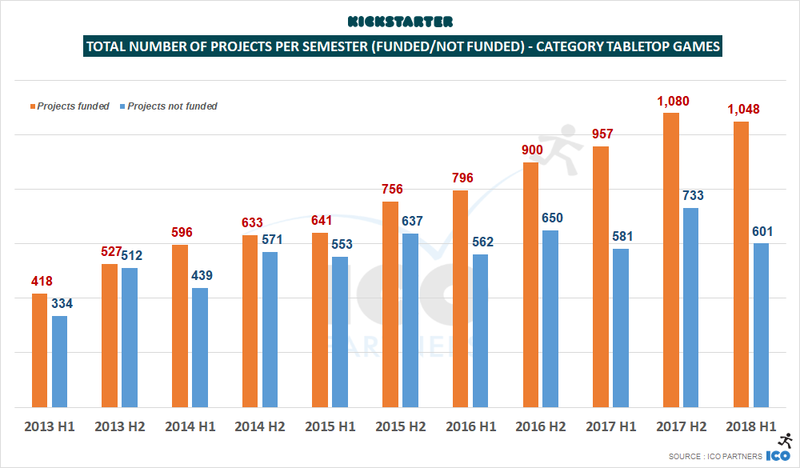 Looking at projects that got funded, we can also observe a drop where there has been a constant growth for the past five years. This is the first sign of either some fatigue, or maybe we have reached the critical mass of unique, quality tabletop projects that can be submitted in a given period. There has to be a ceiling on how many of these projects can exist. 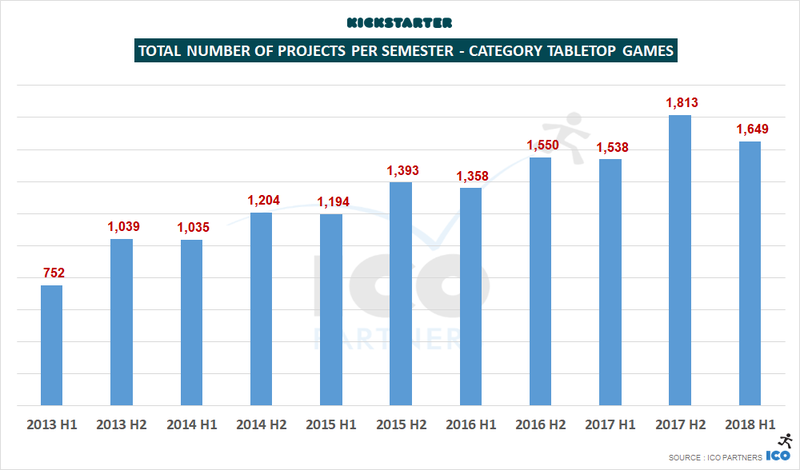 Despite a drop in the total number of projects that got funded, we end up with the highest “success ratio” for tabletop games ever. Almost two thirds of the tabletop campaigns manage to reach their goal. There are more projects raising more than $50,000 than ever before. 32 projects raised more than $500,000 in the first six months of 2018. That’s 13 more projects than the previous best semester. 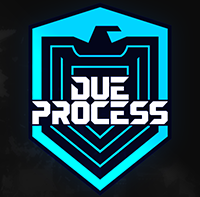 Unsurprisingly, with more funded projects in higher tiers, they have raised record amounts for all tiers above $50,000. Also notable is that all the projects in those $50,000+ tiers have raised more on average than any semesters before. Projects that raised more than $500,000 amount to a total of $40m raised this past semester. That’s half of all the money raised by tabletop projects, and 15% of all the money raised on Kickstarter during this period. I have had a very cursory look at other crowdfunding platforms, especially Ulule, Game On Tabletop, and Indiegogo, that all have tabletop games projects submitted to them on a regular basis. 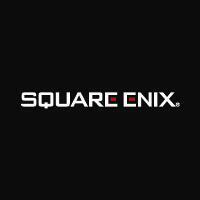 I have not been able to include them in this analysis though – the amount of time it would require to parse their projects, as they are not using the same categories as Kickstarter, was too significant in comparison to their relative size to Kickstarter. It would also require to filter projects that are reported in these platforms when they were in fact funded on Kickstarter and the platforms are used for Slacker/Late Backers campaigns or for pledge management. Kickstarter is where most of the funding happens, and the overall trends can be taken from its numbers. The bubble is not bursting. If anything, there are signs of reaching a stable critical mass for tabletop projects. What is a more important take away to me is that games are now the cornerstone of Kickstarter, despite having very few features in place specifically to support them. The Games category, taken as a whole, represents more than a third of all the money pledged to Kickstarter so far in 2018. It might be strategic for the platform to consider looking into building on that strength, or it will be leaving open this opportunity to one of the competing platforms.